Remember the times of plenty. Having plenty of time. Time for ideas to be written and erased. As the competition heated up, a number of 10s and 9s were given out by the judges . Whilst final scores were counted, we had a fancy dress competition. The winner was Sheffield heat champion, Sarah Thomasin, who went home with a cash prize. But, of course, there could only be one winner. 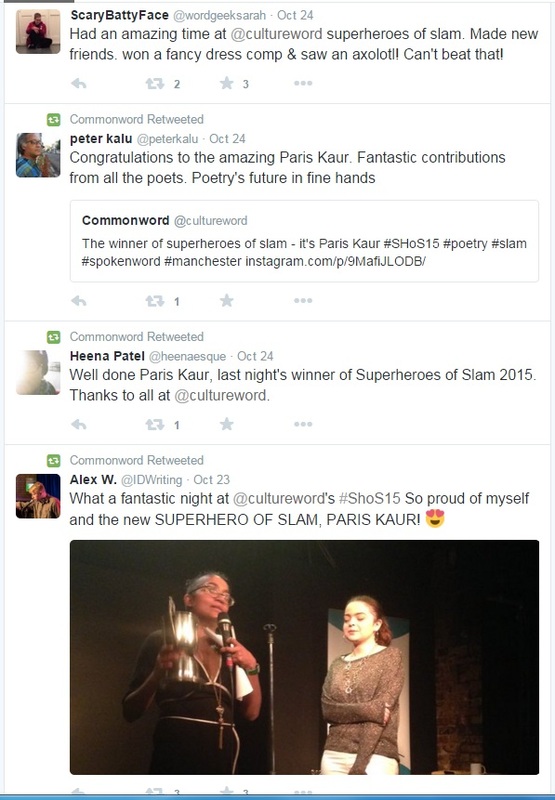 Paris Kaur emerged triumphant as our winner, her second poem on the theme of child abuse moved the audience and won her the slam champion title. She also received £250 and a voucher for a course of their choice at Arvon*. The event was a huge success and was an entertaining and engaging evening for all who attended. Attendees later took to social media to congratulate the winner and share their thoughts on the evening. See below for the pictures from the event.